The first reports of Daesh developing chemical weapons appeared in November, 2015. The AP, basing their reports on information from the U.S. and Iraqi intelligence, stated that the terrorists were actively developing chemical agents with the assistance of highly qualified specialists from Iraq, Syria and other Middle East countries. 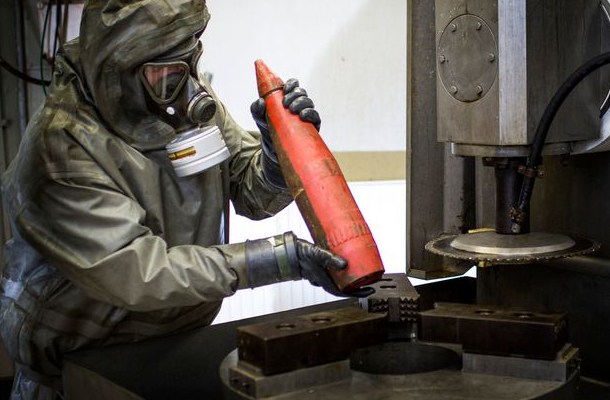 Since Daesh emerged, it has on numerous occasions used chemical weapons in Syria and Iraq. In particular, the terrorists carried out a chemical attack against the Syrian army in Deir Ezzor in April 2016 and the Kurdish-held neighborhood Sheikh Maqsood in Aleppo in March and April 2016. ISIS has repeatedly used chemical agents in Mosul. In November 2016, Britain-based HIS Conflict Monitor reported that since 2014 to Nov. 2016, the Islamic State conducted at least 52 chemical attacks. Initially, the terrorists used chlorine which can be handcrafted. This agent rarely kills. Unlike chlorine, sarin and mustard gas are combat agents which require industrial environment and qualified specialists. According to high-ranking Iraqi and American officials, ISIS captured a laboratory at Mosul University in 2015 and used it to produce chemical weapons. In an interview to Akhbar al-An channel on Jan. 16 2017, the Syrian chemical weapons expert Nuri Primo claimed that Daesh was capable of producing chemical agents in the lab. Meanwhile, NATO members were aware of the fact the ISIS possessed chemical weapons but recently are making efforts to conceal this information. In February 2016, CIA director John Brennan acknowledged that ISIS militants had access to the production of chemical weapons. Another NATO member, Turkey, in November 2016 for the first time accused the jihadists of chemical attacks on the Syrian opposition in northern Syria thus confirming that ISIS possessed it. Moreover, in an interview to Inside Syria Media Center, a source of Turkey’s General Staff who preferred to stay anonymous has recently confirmed the information in the media that the Iraqi troops were attacked by chemical weapons. In particular, on April 15, 2017 IS militants carried out a mortar shelling of western Mosul using shells containing unidentified agents. Seven Iraqi police officers were injured during the attack; they were hospitalized with the signs of asphyxiation, lacerations and skin irritation. The source also added that military advisers, who previously trained FSA troops in El-Bab together with the U.S. special services, would soon be deployed to Iraq. He said that the training program included methods of identifying the presence of chemical agents in the air and using personal protective equipment. NATO is well aware of ISIS’ chemical weapons stored both in Syria and Iraq. However, in sight of the latest events, it is attempting to conceal the fact that the terrorists are capable of producing and using these chemical agents, as well as selling them to other radical groups in the region. It doesn’t comply with the U.S. and Turkey’s baseless accusations of the Syrian government’s alleged chemical attack in Khan Sheikhoun which became a hot topic in the media unlike the events in Mosul.